The province of Quebec is located between Ontario and Newfoundland and is also known as Canada’s largest province. The capital city of this ancient province is called the Quebec city, and its largest city is the city of Montreal. Some 8,164,361 million people live in this francophone province; however, English is also popular among people. This province plays a great role in some of the political topics. Same as most of the other provinces in Canada, Quebec has a humid continental climate. The temperature from north to south in winter time is from -10 degrees to -25 degrees, but in summertime, the temperature varies from 5 degrees to 25 degrees. These temperatures may change at different times and places. For instance, the temperature may reach -40 degrees in the winter time and 35 degrees in summer. The government of Quebec province is powerfully handling different economic sectors such as manufacturing and service, natural resources and energy, and agriculture. As an example there are many mining and forestry happing in the manufacturing sector in Quebec. 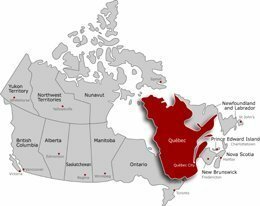 As we mentioned before Quebec is an ancient province, so obviously Quebec is surrounded by many old and fantastic places for tourists who travel there to visit them. For more information about studying in Quebec universities and collages contact us.